High copper and other mineral imbalances are associated with short term and chronic depression. A link has also been associated between iron deficiency and emotional disturbances such as depression and anxiety states. Depression can be effectively and naturally addressed with mineral re-balancing, without the use of drugs. High tissue copper has been associated with an increased incidence of depression, especially in women, oft en occurring near their menstrual period. The causative role of excess copper in depression may be due to its producing neurotransmitter imbalances in the brain, or its interfering with other nutrient minerals such as iron, zinc and manganese. There is more than one type of depression and each type is based on key nutrient makers that can be found in a hair test. Toxic metal depression can also be found in a hair test. A high level of copper and calcium plus high calcium levels relative to magnesium are the key contributing factors to depression. Copper toxicity depletes zinc, magnesium and vitamin B6 which are nutrients required for serotonin production. Serotonin enhances mood and creates a sense of well being. As these minerals are depleted, depression can result. When the thryoid function and adrenals are over taxed, this adds another burden to the body. Someone with a slow oxidation pattern is more likely depression. During puberty and as menstruation begins, teenager girls are at increased risk of depression because as their estrogen increases it raises the retention of copper. 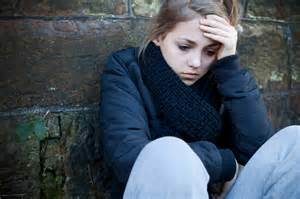 Providing the correct nutrients to balance mineral levels, avoiding birth control pill use plus detoxing excess copper before adolescence will lessen the risk of depression, anxiety and psychological disorders for teenager girls. Excess copper can affect monoamine oxidase (MAO) and serotonin levels and result in depression. The MAO enzyme is involved in removing the neurotransmitters norepinephrine, serotonin and dopamine from the brain. Anti-depressant drugs prevent this from happening to makes more of these brain chemicals available – but they also deplete the key minerals of zinc, magnesium and vitamin B6 in the body, resulting in high copper and increase anxiety. 17% of the people with depression are in this category. This form of depression is seen about 95% of post-partum women. These people have high norepinephrine, a precursor to adrenaline as a result of high copper. These people have low zinc which also means they have low GABA, which is a calming neurotransmitter. 5% of the people with depression are in this category. There is no safe level, accumulates in the brain and kidney and disrupts numerous brain and body functions. Toxic metals in the brain can cause significant health issues including weakening of the blood-brain barrier, altered neurotransmitter levels, destruction or demyelination of the myelin sheath, increased oxidative stress, destruction of glutathione and other protective proteins.